I hate to break it to you, but sometimes Miata is not always the answer. 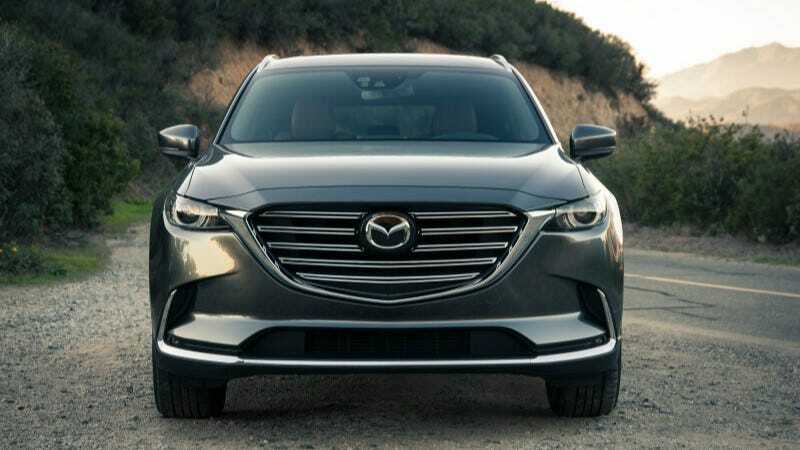 However, if you need a crossover to complement your roadster, the all new 2016 Mazda CX-9 will go on sale this Spring with a starting MSRP of $31,520. Mazda hopes to bring some zoom-zoom to the mid-size crossover segment with the 2016 CX-9 and its 2.5 liter, turbo-charged 4 cyl engine that delivers 310 lb-ft of torque. It will come in four trims, Sport, Touring, Grand Touring and Signature. Front-wheel drive Sport models ($32,420 with the $900 destination charge) will come standard with LED headlights and taillights, fabric seating surfaces, an electronic parking brake, 18-inch wheels, rear backup camera, trailer stability assist, MAZDA CONNECT infotainment, and a seven-inch color display. You can also add the Sport Package for $950, which gets you a power driver’s seat, heated front seats and heated door mirrors. None of which are terribly “sporty,” but are nice features to have if you live in cold weather climates. Next up is the Touring trim ($36,870 including destination) that comes with some advanced safety features such as Blind Spot Monitoring with Rear Cross-Traffic Alert. Mazda will also throw in HomeLink garage door openers, black- or sand-colored leather seating surfaces, Mazda Advanced Keyless Entry System, a power liftgate, power front seats, and an 8 inch MAZDA CONNECT touchscreen display...that’s once inch bigger! Not satisfied with all those goodies? Pony up another $1,745 for the Touring Premium package and you will get: automatic on/off headlights, LED fog lights, navigation, a premium 12-speaker BOSE audio system, rain-sensing wipers, rear backup sensors, second-row retractable sunshades, SiriusXM satellite radio, automatic Smart City Brake Support and a sunroof. Do you prefer your touring to be a bit more grand? Mazda has you covered with the GT trim ($41,070 including destination). The Grand Touring adds Adaptive Front-lighting System, 20-inch wheels, aluminum interior trim, Mazda’s first Active Driving Display that projects instrument and navigation information onto the windshield, high-beam control, lane-departure warning, lane-keep assist, Mazda Radar Cruise Control with Smart Brake Support, roof rails and memory settings on the driver’s seat. If you want all-wheel-drive, tack on an additional $1800 to the above trim levels. What’s so special about Mazda’s predictive I-ACTIV all-wheel-drive? It has 27 sensors to sense road conditions! I bet your silly crossover is only using 26 or fewer sensors to keep traction. How can you be sure it is predicting properly? I know it’s hard to contain the excitement for all this crossover madness, but for a mere $44,915 (including destination) you could have a CX-9 Signature. That comes with standard all-wheel drive, in addition to LED lighting everywhere they could cram it, Auburn-colored Nappa leather, and rosewood supplied by Japanese guitar-maker Fujigen. Now you are really rockin! The last generation CX-9 never gained much popularity with folks shopping in this segment, but it was surprisingly fun to drive given its size. The 2016 model seems to have the style, performance, and features to make it a hit.